Ever go to the Jersey shore? In the '80s? If you haven't -- or didn't -- it's possible you've never witnessed the glory of the fringed halter half-shirt. 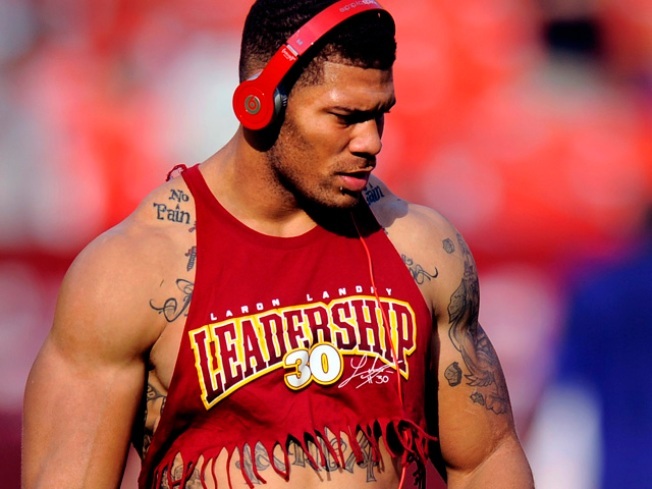 At least, not until you gazed upon the photos of LaRon Landry's impressive form practically bursting out of this fabulous ensemble. The image originated here on WashingtonPost.com, with commenter Section104 noting, "I think the cheerleaders should wear that top for one of the home games." But aside from his decision to wear it, the question must be asked: Who created this delightful get-up? You think he stayed up late in his training camp dorm room with a seam marker and a pair of sewing shears? Think he paused in between pushups to check on how the fringe was starting to curl? Everyone has a lot of questions for the players going into the Redskins' season. Unfortunately, some of them won't be answered. Like all the questions we have about this shirt.